Conducting regular play therapy sessions each day will often reduce or eliminate bad behaviours in cats, particularly if they are caused by anxiety, boredom, or excess energy. Therapeutic play sessions can be anywhere from 5-30 minutes twice a day or more, depending on how much time an owner has available. Starting a play therapy session when the cat is about to misbehave or during the time of day when he tends to be most active is particularly effective. If a cat is anxious about a particular room in the house or an object, play therapy can be conducted near the feared object or the doorway to the feared room and gradually moved a tiny bit closer with each session. The same can be done for a cat that is phobic of another person or animal, though it is important that the feared individual be calm, still, and quiet during play therapy for this systematic desensitization strategy to work. 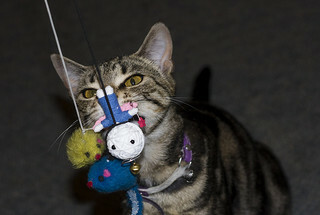 Play therapy can also be used to stop a cat from spraying, urinating, or defecating on a certain spot in the house when these behaviours result from anxiety. Conducting play therapy on the spot where the cat eliminates inappropriately can create a different association with that area and thus reduce the likelihood that it will be used as a bathroom in the future. Play therapy is also beneficial for cats that suffer from generalized anxiety. Nervous cats, like nervous people, can reduce their anxieties by getting plenty of intense cardiovascular exercise. Temporary anxiety states caused by major changes such as moving house can also be relieved using play therapy. When two cats have an uneasy relationship with one another, parallel play therapy can be beneficial. Use two toys and play with both cats simultaneously, but in such a way that they both have plenty of space. This can be done with toys that allow for distance, such as wands with long ribbons attached. An owner can move two of these simultaneously, casting the ribbons to opposite ends of the room. Parallel play therapy can help cats to develop more positive associations with one another. However, if one cat tends to bully and dominate the other, the cats may require separate play sessions, with the bully confined to another area of the house during the subordinate cat’s playtime. Bored indoor cats may engage in vacuum activities such as mad dashes around the house, provoking other animals and people to get a rise out of them, or being destructive. Both interactive and solo play sessions can help to siphon off this extra energy, which results from the frustration of not being able to engage in natural proclivities such as hunting. Interactive play sessions should last until the cat is too exhausted to go after the “prey,” and overly energetic cats should also be provided with solo toys such as catnip mice or mylar balls that they can bat around on their own as well.